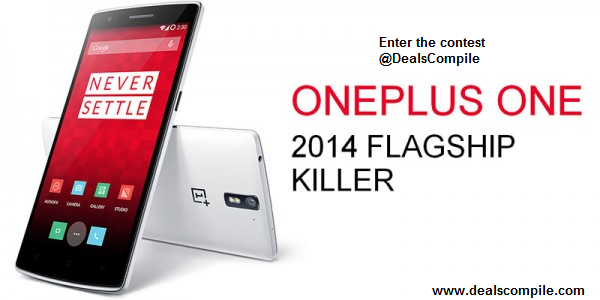 You must have heard about the OnePlus One - The Flagship Killer.If no , check it out here - OnePlus One. Most of the people wanting this beast are tired of waiting for the invites from OnePlus and also irritated of the invites selling.So at DealsCompile have decided to help all of our followers in getting their favorite OnePlus-One. Participate in the contest by just doing these simple steps and and we will give you an invite for the OnePlus One for you so you can order it .This will be done for 10 lucky winners. -Complete all the task prescribed in the below gleam box. -Perform some task daily to gain more entries. -Share this page with friends to gain more entries. -This Contest is for India Only. -There will be 10 winners only. -Only invites will be given . -After the contest is over , participants will receive an e-mail from us.So you just have to send us the details and we will order it for you and there is no re-selling of invites. -Contest will end on 9st December 2014, 8 AM. -Gain Maximum Entries and Win. -Our Decision will be the final decision. -Orders will be provided by us and in no way sponsored, endorsed or administered by, or associated with Amazon or any other stores. All the Best and keep Compiling !! The winners of this contest will be announced on 7th January 2015 itself. DealsCompile will keep bringing such kind of contests to bring smiles on your face.So keep following and earn more entries to win this uber cool contest.